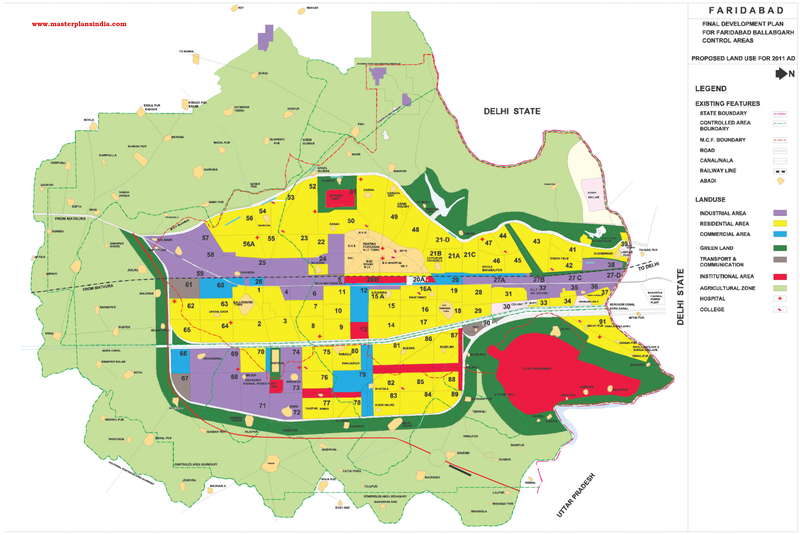 Faridabad Master Plan 2031 released in July 2014 has been prepared for a projected population of 38,86,407 in 2031 compared to the current population of about 17 Lakh. 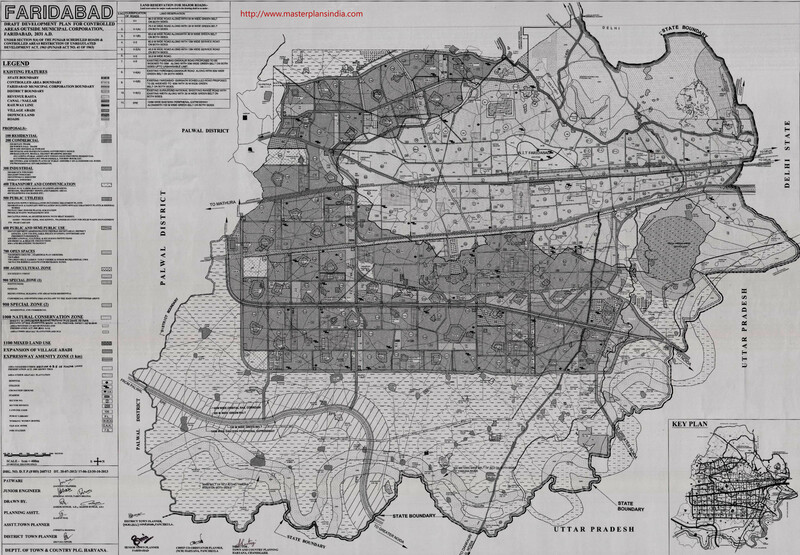 Below is the new map of Faridabad’s 2031 Master Plan. I V-1 90 metre wide road with 30 metre green belt on both sides. II V-1 (A) 75 metre wide road with 30 metre green belt on both sides. III V-1 (B) 60 metre wide road with 30 metre wide green belt on both sides. IV V-2 60 Metres wide road along with 12 metre wide service road on both sides. V V-2 (A) 45 metre wide road along with 12 metre wide service road on both sides. VII V-6 Existing Faridabad-Dankaur road widened to 30 metre along with 30 metre wide green belt on both sides up to urbanizable limit. VIII V-6 (A) Existing Faridabad-Dankaur road from urbanizable limit to U.P. Border along with 30 metre wide green belt on both sides. IX V-6 (B) Existing Faridabad-Gurgaon scheduled road widened to 90 metre with 30 metre wide green belt on both sides. X V-6 (C) Existing Surajkund-National Shooting Range road with existing width with 30metre wide green belt on both sides. XI Eastern Peripheral Expressway 100 metre wide Eastern Peripheral Expressway alongwith 100 metre wide green belt on both sides. Award ya paisa dene ke liye….. I want to sale my plot of 50 yards situated in Dungarpur Faridabad. If anybody interested please contact on 8130553049 and 9560837076.
when will be plots for sector-75 open to public? and expected price per sq yard? plz call for genuine deal. I want to purchase approx. 100 yard plot at dungarpur, faridabad with registry. Can any body know the status of land, approx. rate per yard and future of this area. Sir, I want to purchase a plot in nagala gujran but they can’t gave registry due to unauthorized area. What can I do? Please don’t purchase any land in jasana because registry of the land is not being done so abstain from builders. Once you give money towards land no chance of refund. sir i want to a plot in sarurpur ballabgarh faridabad.please suggest for future plan.